The film “Life of a King” is being screened on Tuesday 30th August at Walthamstow Empire cinema. 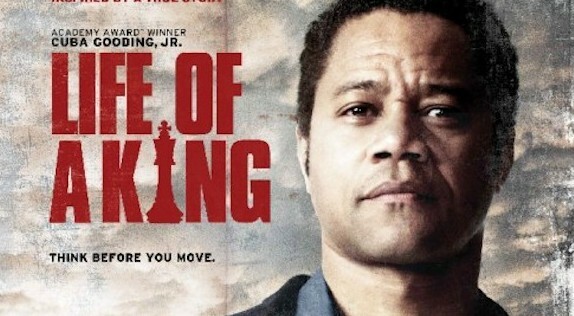 The film stars Cuba Gooding Jnr, and is an inspirational tale based on the true story of an ex-con who, determined to help at-risk youths avoid the mistakes he made, forms a chess club to offer them an alternative to street gangs. Tickets are £10.50 and the screening starts at 7pm – full details can be found here. As part of the screening, Hackney’s first team captain FM Bob Eames is giving a free simultaneous on the afternoon of Saturday 27th August. Keep your eyes posted on Hackney’s website for details. I appreciate that my new chess club thinks and organises chess in the round–with matches for all levels, pub chess, group lessons, simultaneous displays, volunteering in community libraries, support to a nearby junior club, and even film screenings. That’s just an off-the-cuff list. There’s probably more. I’m also impressed that club leaders are building solid habits in club governance, including a much needed constitution. Great work guys and gals! I’m looking forward to watching ‘Life of a King’ and loving chess more and more. Previous Previous post: Sue Maroroa vs. Hammersmith!